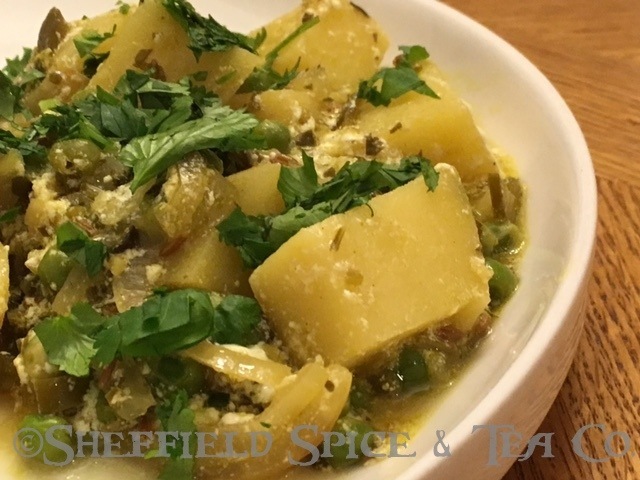 This New Potato and Pea Curry is a tasty vegetarian/vegan dish, which is great alone or can served as a side dish. The Madras Curry Powder and other spices combine to offer a sensory experience for both for your nose and your mouth. The textures of the potatoes and peas also add a dimension to the dish. Adding the yogurt helps thicken the dish a bit, as well as adds bit of a sweetness. You can also add some cubed Paneer cheese at the end, stirring in gently and letting it heat for a few minutes for a variation. 3 Red Chile Peppers deseeded and finely sliced (Use Tien Tsin, Japone or other fresh red chiles. You can also use dried red chiles and just rehydrate them for a few minutes in warm water before deseeding and slicing.) We have used Jalapeno peppers wen red peppers were not available. The flavor is still excellent. 1 Small bunch of Cilantro, finely chopped, stalks and leaves, keeping the leaves and stalks separate. 16 oz Plain Yogurt. Use regular for best flavor and texture, but we have used low fat without any problem. Heat the oil in a large, deep frying pan over medium-low heat. Add the onions and cook for about 10-15 minutes until they get soft. Watch so they don’t burn. Add the chiles, ginger and the other spices. Cook for a few minutes, stirring a bit to blend well. Add potatoes and lime juice. Stir again to coat well. Add chopped cilantro stalks and vegetable stock. Simmer for about 30 minutes, or a bit longer, until the potatoes are fork soft and the sauce has reduced to a curry thickness. Add the peas and cook another 5-7 minutes. Add the yogurt and stir in. Scatter the cilantro leaves over the top and serve with the naan bread.